Photo Credit: CrusePhoto. com, Also on Twitter at @CrusePhoto. I ran my very first marathon at the 2007 Houston Marathon in 2:22:21 missed the Olympic Trials standard by 21 seconds. It was brutal. Almost exactly 7 years later (yesterday, January 19th) I ran the 2014 Carlsbad Marathon in 2:22:15….only a full 6 seconds faster! At face value, one might think that this marginal progression would upset me. They’d think I’d be disappointed with my most recent performance and question how “slow” ultra running might be limiting my “speed”? But I’m not upset or disappointed at all! In fact, I am quite pleased with my 2:22, 2nd place finish at Carlsbad (even though it was my 8th career marathon finish and far off my personal best of 2:16:52 set back in 2011). Why? 1. Carlsbad is a pretty hilly course! There were a lot of little hills that amassed to around 1,000ft. of vertical climbing over the 26.2 miles. Furthermore, there were also quite a few U-turns (some that I accidently took extra wide when almost getting lost and running the wrong way!). 2. I competed well. Despite going out waaay to slow with a first mile split of 5:40 and dropping back to 6th place (due to my lack of marathon –pace specific speedwork and because the race started in the dark), I was able to rally as the race progressed and finish with one of the strongest last 10km of any marathon I’ve run. While, I couldn’t catch eventual winner Abiyot Endale of Ethiopia (a 13:39 5km, 2:15 marathon runner), I did pass 2013 Philly Marathon Champion Abebe Mekiyura of Ethiopia (2:15 marathon PR as well) and “outkicked” Mario Macias (13:38 5km, 28:02 10km, 2:15 Marathon and 2:08 Pikes Peak Ascent PRs) in the final half mile. These guys are better runners than I am, but because I went out so conservatively and ran my own race I was able to nab 2nd place. 3. I was “Moving Down.” By this I mean that my last year of racing has been pretty much ultra marathon racing (and training). I raced three 100kms, three 50-milers and a 50km all on the trails/mountains in 2013 and much of my foundation of training was geared towards those efforts. Instead logging the typical 120 miles a week I would train on the roads for past marathons I only averaged around 90 miles a week for Carlsbad (part of this was because I was training for TNF50 in December but then was knocked out with the flu for an entire week and didn’t run at all). So ultimately I had about 5-weeks of “marathon specific” workouts…with no long tempo runs even close to 2:20 marathon pace! In all my other marathons I was “Moving Up in distance.” I’ve found that in my progression of distance running this has always been a more natural progression for me: move up from racing the mile and PR in the 2-mile event; move up from the 5km in college and do really well at the 10km. When I ran that first marathon in Houston I was coming off of 8km cross country training and adding in some 22 mile long runs here and there. Marathon pace would feel more like a “jog.” At Carlsbad, coming off of trail 50-milers raced at 7:30s/mile pace, marathon pace (5:20s per mile) felt more like a sprint! All speed is relative. So why even bother moving down (or up) in race distance? Why try to mix it up at a race distance that isn’t your favorite, on a surface that isn’t as fun? (Notice this goes both ways with roadies moving up from 5km to marathon to ultra trail races, AND ultra-trail specialists moving down to pavement pounding marathons and half marathons…or even a track race!). Variety in racing and training means a new stimulus for your body to respond and adapt too. The key is to make that adaptation a positive adaptation. Certain stresses elicit specific responses in the body at the cellular level. For example, for a ultra-runner moving down to marathon and under distances on the road (or track) a new stimulus of speed training can be addressed. Working on the high intensity of Lactate Threshold and Vo2max efforts can improve your ability to power up hills. The higher velocity and faster running surfaces trigger more fast-twitch muscle fibers in your legs to improve your running form, get a higher stride rate and improve mechanical efficiency at all sub-maximal speeds. On the flip-side (and I hope this eventually applies to me if I actually can run a sub 2:15 one day) moving up in distance and training and racing for longer events (ie a marathon roadie doing a trail-ultra 50-miler) can improve your fat burning utilization, while giving you that extra tendon and muscular strength and endurance to conquer the last few miles of a half marathon or the last 10km of a road marathon race. The uneven surfaces of long trail runs and inevitable hills work the leg muscles a bit differently (as well as your core/lower back) while allowing a break from the pounding impact force of pavement. Just by training on a lot of hills can build speed and strength! 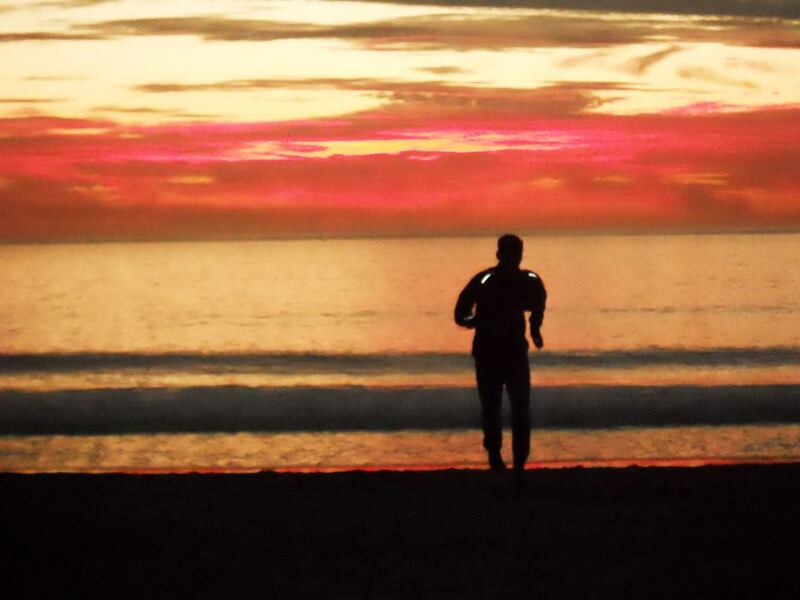 Photo credit to Sandi for this shot at sunset on the Carlsbad, CA beach! Now I get to move back up in distance as a prepare for a spring of racing ultras, including the Tarawera 100km in New Zealand and the Lake Sonoma 50 in CA. I’m pulled in all sorts of directions from short distance mountain races to track ultras and the challenge of steeping up a crazy 100-miler. There are too many races to choose from and I know in order to compete and be sustainable in the sport I’ll have to pick my battles carefully. One thing I know for sure though is that I still want to qualify for my 3rd US Olympic Marathon Trials. The time standard is now the fastest it’s ever been in US history, with a standard of 2:18:00 just to meet the “B” standard and gain entry. However, I’m now even more confident now that on a fast course, with 2months of specific road/track speedwork under my belt I can achieve this goal. Thanks for reading and change it up in 2014! PS: You can also follow me on The Twitter, The Facebook, and The Instagram. I credit my new, light Huaka shoes from HOKA One One for allowing me to run well again on the roads. Instead of cringing on the downhills I was able to FLY with a couple sub 5min miles during the race! Furthermore, my legs don’t feel as crappy and sore the day after. I credit products from Flora Health as allowing me to utilize fat better as a fuel (and thus spare glycogen stores for the final 10km of the race) so that I could run a stronger, more even paced-race (as well as being healthier overall in general thanks to all their vitamins, minerals and nutrient products! During the race I took 5 Vfuel gels. I never had any stomach distress (I usually do at some point in a marathon) and never hit any major wall (like I do in most of my marathons). At sunrise I flipped down my Smith Optics Pivlock V2 shades (my favorite for running in) and was able to relax my facial muscles and jaw more as I didn’t have to squint with the glare of the sun. Despite feeling like the pace was mechanically very fast, I was still mobile enough in my hips and upper leg muscles to hold most of my mile splits in the 5:20 range long into the race while my competitors faded. I credit this muscle mobility to the massage and acupuncture work I get done at Integrative Healing Acupuncutre and Wellness here in Boulder. Before and after the race, both Sandi and I had some nutritious and delicious snacks in the form of Ugo Bars. These healthy bars are the first thing I ate to recover after finishing the marathon! Also before and after the race (yes I checked a bag and traveled with some cans!) I indulged in my favorite Avery Brews. Nothing like the bursting flavor of hops and the unique craft brew taste of a Boulder-made Avery! To check my mile splits and average pace I used a Garmin 910XT and uploaded my results on Strava here. Strava has helped me track and analyze my training for the past year and I now use it for every run, workout and race! Finally, my Drymax socks kept my feet blister-free even in relatively warm conditions, pounding out 26.2 miles fairly hard on the pavement. I used to finish with blood stains visible on my shoes! I really dig those HOKA Huaka shoes (of course I like HOKA shoes anyway). You did some sub 5min miles with HOKA that has be to some kind of record. How does the Huaka compare cushioning and feel wise to the Rapa Nui Trail I know you have been wearing? Hey thanks George! I did hit a 4:55 during the marathon (around mile 11 or so I think) on a downhill. I think someone has run an open 4:36 mile in a pair of HOKAs so they can for sure go really fast!! The Huaka just flat out feels lighter and a tad softer…the Rapa Nui is great and for ultra-trails it’s better to have more of the support/firmness/traction it provides (Huaka is more designed for the roads). Also exciting is the new Clifton model that will be even lighter than the Huaka! Amazing technology coming from HOkKA these days. Great write up Sage. Glad to hear you were happy with your marathon. Was Sandi happy with her race? Curious to know more about your HOKA shoes you wore. Some people might find it very hard to run so fast with such a cushy shoe( me being one of them). I know speed is relative for each person as you stated above. Is it really an adjustment for the shoe or are they that responsive that it is not that noticeable. Congrats again to you. Sandi was expecting to run a bit faster (she wore some old zero-drop shoes and had some leg/muscle issues early on). I have no doubt she can go sub 3:00, it’s just over the holidays we didn’t get in as much speedwork on snow-free roads and tracks as we probably should have. Anyway, yeah it depends on the HOKA model. Since the Huaka is so light and fairly medium/soft (but still only 2mm drop or so) it didn’t take me any time to adjust to it. It probably depends more on your personal running form and what kind of shoes you are transitioning from. As with any shoe company there is a big difference between different models (ie the Huaka is not like the Conquest etc.) so it may suit someone differently. I made sure I trained several hundred miles in the Huakas before racing in them and they worked great for me. Best of luck with your training and racing in 2014! To address Mark’s question I am now running in the HOKA Conquest which while not as light as Sage’s shoe is very nimble and surprising quick. Having run in the Bondi Speed, Rapa Nui Trail, and Rapa Nui Tarmac the Conquest with it RMAT EVA is a totally new experience for anyone who has run in HOKA before. I can’t wait for the Huaka to come out this is my must get shoe for this year. Thanks for your feedback! The Conquest is full of new technology and you can now demand more (speed, response, durability etc) out of your HOKAs. The new products are very exciting and HOKA is committed to designing these new models for runners at all events/distances, speeds and for trails, mountains and roads! Thank you for your support and best of luck with your running. Thanks for all the feedback including George’s comments. For reference, I used to be a “minimalist” runner for a couple of years. Just finding I like a bit more shoe. I like cushy responsive and pretty flexible shoes. That’s not too much to ask is it? I currently running in the brooks pure flow3, scott t2c evo. And no Sage I’m not copying you. 🙂 I’m considering getting the Brooks goast for my easy/recovery shoe. Do the new Hokas fit wider than the older models? I have a pretty wide midfoot and toe splay. As with any shoe it would probably be best to try them on first (different HOKA models seem to fit a little more wide/narrow and are different in terms of flexibility. My favorites are the Kailua and the new Huaka which I think are pretty medium widths (something along the lines of a Brooks Ghost and many other competitors). I’m really excited about the new Clifton model (which is rumored to be lighter than the Huaka). Best of luck with your training. Hey thanks so much Jason! That marathon photo is awesome! I hope it makes it to your STRAVA avatar. It’s really epic. It captures your love of running and racing excellently. Also thanks for filling us in on what you ate during the marathon. 5 gels, that’s awesome. I took in 7 gels for a 3:32 marathon and needed every last bit! What does the A stand for on your shorts? Thats a good idea…gotta change up the old Strava avatar sometime! Yeah, I took Vfuel gels…really easy on the stomach. I also took one about 15 minutes before the start. Along the way I grabbed cups of water to wash them down. Congrats on your marathon. The “A” on my shorts is the logo of my beer company sponsor Avery Brewing Co.
Hi Sage thanks for answering. I was wondering where do you keep your gels during the race? On your body or do you grab them from people along the way? Thanks a lot!!! I have pockets in my shorts (two on the sides and one front pocket with enough to hold 2 gels each)…for ultras I have a waist belt pack that can carry like 10 gels at a time. At some elite races you can have your own fluid bottles on tables and runners will tape gels to their bottles to grab along the way. 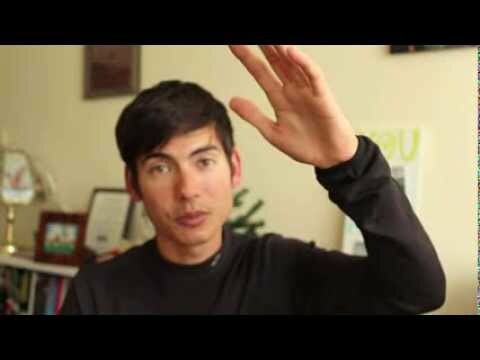 I just watched one of your YouTube videos on 3 workouts for the marathon. It really caught my interest because you mentioned 5:50ish pace for 4 or 5 mile repeats for 3 hour marathoners. Come spring, that’s what I will be shooting for. This is a serious question, I’m not a jokester or troll. I haven’t run a marathon in 16 years. I’m 46 and have run a 2:38 years ago. I simply want to break 3 hours and know with the proper training I can do it. My question is, you just that marathon and took 4 gel packs during the race. What is your trick to not having to go to the bathroom during the race? I cannot figure out what I’m doing wrong and keep having trouble with anything over 10 miles and I hate stopping. You’ve run 2:16, if I recall correctly? You just ran a hilly course days ago, ate gel packs and obviously ate something before the race. What do you eat the night before and what do you eat in the morning…and how many hours before the race do you eat? I appreciate any and all info that you are willing to share. With all the races that you’ve ran and the pace that you’ve run them at, what’s the trick? I realize I am older and my body might be changing, but it’s getting really old!!!! Thanks for your support and glad you like the Vo2max Productions training talk videos on YouTube. I’d say you probably knows what works for you pretty well if you’ve run 2:38 (congrats!). Generally the night before the race I don’t eat a huge dinner. I eat dinner really early (ie 5pm for me) and I have something pretty plain like pasta. Then on race mornining I get up 4 hours before the start and eat a peanut butter honey and sourdough bread sandwich followed by an energy bar (mostly carbs) and coffee. I allow myself plenty of time to go to the bathroom (usually multiple times) before the start. I also go to the bathroom right before the start! Best of luck with your training and go after that sub 3! Adam, I was wondering the same thing about the “A” logo. Congratulations – Sage! I think it’s great to mix up the distances keeps the training & the racing fun. Could you give us more info on the taste / comparison of the ViFuel gels? Ha ha, yeah the “A” kind of looks like the logo for the “Scarlet Letter” or something. Maybe that’s what Avery was going for.. Anyway, I took mostly peach-cobbler flavor Vfuel gels during the race (and one chocolate). The taste is pretty mild and the thickness is pretty medium as far as gels go. They are designed to be easier on most people’s stomachs and i’ve found this to be true. The trick is using more Dextrose instead of Fructose (after a first ingredient of Maltodextrin). That is it’s competitive advantage. THe other flavor you can have is vanilla..but I really like the peach cobbler the best! Good run Sage, especially since as you mentioned you did little to no marathon specific work for this. Carlsbad is a tough course especially the Palomar Airport Road uphill section. You are strong as an ox and the speed will come later. 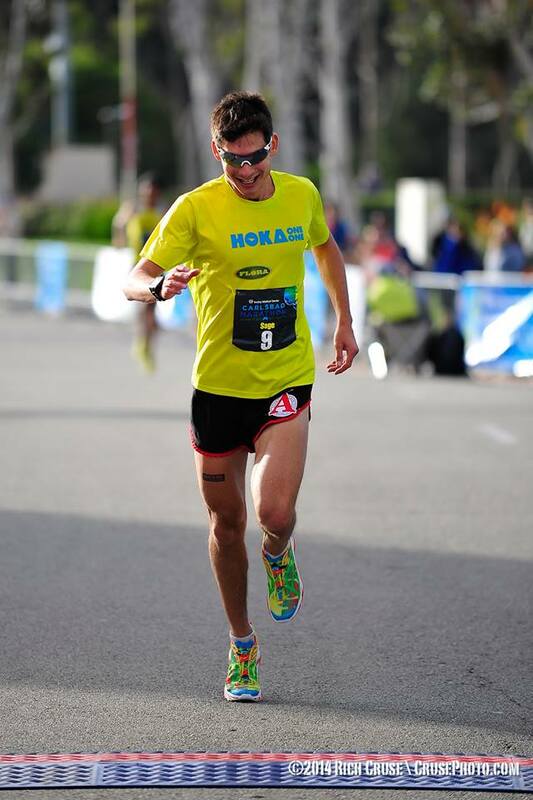 Looks like you were sporting the old Hanson’s shorts with the logo covered up since HOKA is you #1 sponsor now :). The shoes have peaked my interest and I might even try a pair before long. Best of luck in New Zealand and your future races, stay healthy and stay strong! It was quite a challenge to charge up the hills on the course (having light shoes helped). I could fly on the downhills there though (4:55 mile split) in my HOKAs. Well, I had some space on my shorts so I put on my Avery Brewing “A” logo. 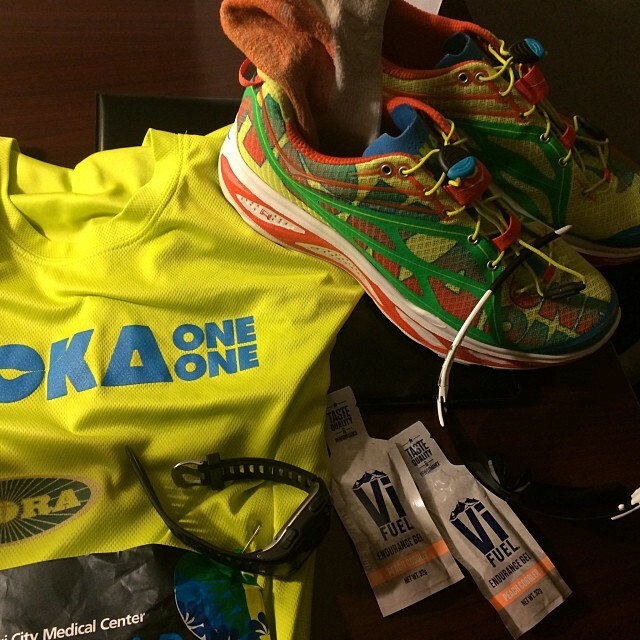 HOKA One One is my big major sponsor of course!! I’m really lucky to be on the HOKA team and to be trying such new, innovative products. right on sage! great work at carlsbad, and great report too. i’m definitely encouraged to once again hear you reinforce the benefits of mixing up the training and racing elements. as i’m still trying to hit the elusive BQ time, i decided that this year i would instead make my goal a 56k trail race – not only my first off-road competition but also my first ultra. i’ve already got a more relaxed and enjoyable feel to my training, and the hope is to strengthen core and foot muscles as well as pick up turnover – and maybe BQ at a marathon that i’ll be tackling during the training cycle. we’ll see how it all goes, but for now i’m enjoying the whole process more than i did during my marathon training last year! great to hear! the training/racing mix is always more fun anyway. Best of luck with the BQ! Lucky? You make your own luck. Great effort. Keep up the good work! Very impressive result. The strength in the final 10K is especially interesting to me. I can’t wait to see you set a new marathon PR. I hope that a year of ultra running helps me to do the same at Boston this year! Congratulations. Hey Thanks Kevin. Congrats on your finish at Bandera. Luckily for us the roads don’t have as many sharp rocks and roots (and cacti) to fall on! I think all the vert. training you’ve been doing will make the hills of Boston a breeze! Hi Sage, I ran at Carlsbad too and as a mostly Rockies trail runner it was inspiring hearing your name announced before the race and seeing you zoom by in the hairpins. Congrats and best wishes for 2014 and for the 2016 Olympic quals! Thanks so much! Best of luck with your future training and races! The HOKA shoe I use is called the “Huaka.” It won’t come out until later in the year though. The Bondi is a good road shoe as well. HOKA also makes the Kailua road and trail versions that are my favorite. The different models feel and work a little differently so it is best to try them on first to decide which one fits you best. Good luck. Got it! Sometimes it takes a while to approve all the comments and provide feedback. I only have time to check this blog once or twice a week so the comments have to wait to be approved first before i see them. Well done on the marathon! I agree with you that both mountain/trail and road/track training are essential for mountain races. I’m curious as to how you see traditional road training fitting onto the trails. For example a 4x2mile tempo workout, do you find yourself running the mileage or the time if you were to take that onto the trails? Thanks man! I’m doing 2-mile repeats today on the road actually.. But I also do them on some hilly, buffed out trails and go by mileage. Pace usually suffers a good 1-2min/mile depending on the hills but the Heart and Lungs don’t know the difference! If it’s a solid uphill tempo (road, treadmill and/or trails) it’s more by time (ie 20-40min effort). So an FKT effort up GREEN MTN is a hard 30min for me usually, but it’s only 2.9 miles! I guess I use both (mileage and time) depending on the workout. I am not an expert, but I am quite convinced that if you plan well, you would break your previous marathon PR by using ultra-trail-mountain running 🙂 Simple theory of adaptation. Go Sage ! Ha ha! Thanks so much for the support and confidence! That would be really great. Best of luck with your own training and racing as well!